Heirloom seeds are open pollinated and can be saved from year to year. Many gardeners just don’t have the space or time necessary to save all of their seeds from year to year. Not only that, but it’s fun to try new varieties and plant different crops and flowers every spring. Sometimes we find that certain vegetables are disease prone in our area or we forget to leave a few carrots and other biennials to flower and set seed the following year. It can be pretty complicated to remember how far apart certain crops need to be planted to prevent cross pollination. There is so much to remember! So what’s a budding seed saver to do? Let’s start with a quick primer on the differences between hybrid, open pollinated, and genetically modified seeds. Small Footprint Family does an excellent job explaining the differences in their article Hybrid Seeds Vs GMOs. I couldn’t have explained it better, so I hope you will take a few minutes to read their article. In a nutshell: Open pollinated seeds can be saved in the fall or (if biennial) the following summer to replant for future crops. Care must be taken to plant these varieties separate from other varieties of the same crop to prevent cross pollination, resulting in a hybrid. If you plant hybrids, you will still be able to plant the seed the following year, but the next generation will not be genetically the same as the old crop. Genetically modified seeds have DNA from other organisms implanted into their genetic code and will not produce seed the same as the old crop. It is not the same as a hybrid and many countries are banning GMOs because there are questions about how safe they are for human consumption. But that’s a topic for another post. Saving corn seed for next year. Now, if you wish to save seed from year to year, decreasing your gardening costs and improving your self reliance, you’ll want to plant open pollinated seeds. 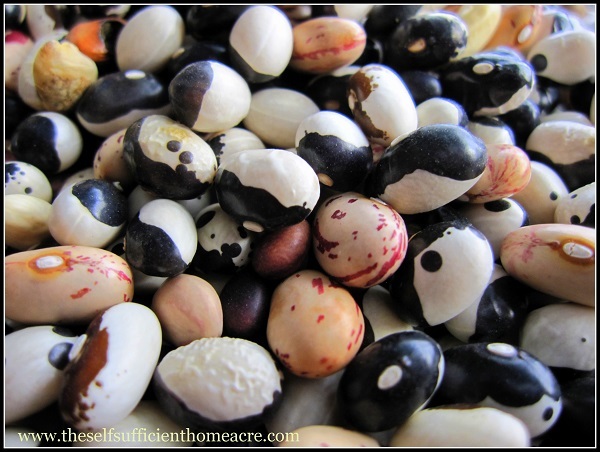 Many times these are referred to as heirloom seeds, seeds which have been saved from generation to generation. Heirloom seeds may not always have the best disease resistance or keeping qualities, but they often have some of the best flavors. This is perfect for home gardeners searching for the tastiest tomato and the sweetest carrot. Since you don’t have to ship your produce 1000 miles before it will be enjoyed, you have the option of choosing vegetable varieties that favor flavor over thick skins. Many home gardeners who save their seed from year to year find that, in time, they are able to select the best tasting, least disease prone offspring for the next crop. Selective seed saving ensures that you are developing a variety best suited for your local soil and weather conditions. Some crops will remain true to type when planted just a few feet from other varieties of the same vegetable. Some crops need a great deal of space or you will need to hand pollinate and then cover the developing ovary with a paper bag or other barrier. This will prevent pollinators such as bees from introducing unwanted pollen to the flower, creating a hybrid. Onions are biennials, meaning they flower and produce seed in their second year. In general, tomatoes, peppers and beans need around 10 feet between varieties, but corn, melons, squash and pumpkins need much more space to retain genetic purity. If you plant varieties of corn that tassel out at different times, it can be planted fairly close. Melons and squash can be hand pollinated. Planting a tall crop between two varieties will help prevent cross pollination by wind, but it will not prevent pollination by insects. So there are ways to get around the space requirements if you are willing to do some planning and work. You can also plant just one variety of a crop and save the seed every year. This might be the easiest method. However, if disease wipes out that crop, you may be starting from square one the next year. Squash seed cross pollinates easily. One of my goals this summer is to save seeds from a larger percentage of my crops. I’ve saved tomato, hot pepper, dent corn, squash and pumpkin, bean, pea, and lettuce seeds in the past with pretty good results. 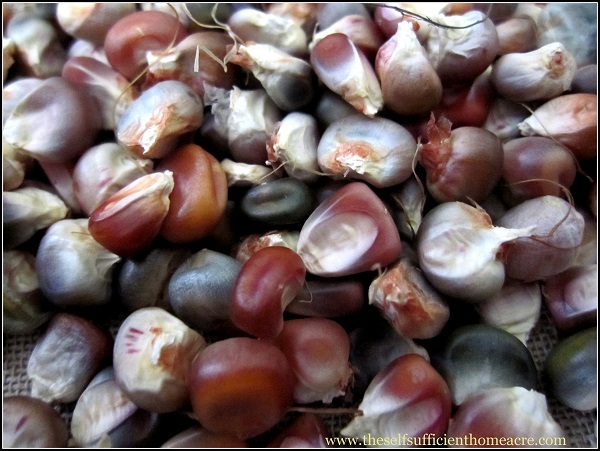 Do you plant heirloom (open pollinated) seeds? Is learning to save seeds important to you? Or are you an old pro, saving seeds every year? I enjoyed reading this but so much is over my head. I save my marigold seeds and my zinnia seeds every year. I tried planting onion seeds one year and they never showed up. 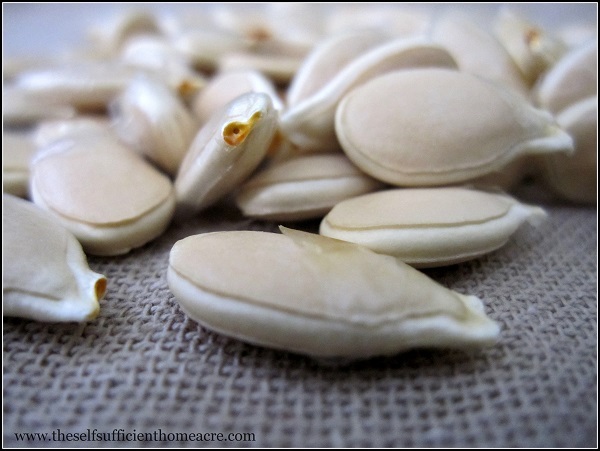 Do you have specific articles on how to save certain types of seeds? Like onions what do those seeds look like and when do I know they are ready? Carrots and turnips…they are both biennials as well? How do I know when they have seeds ready for picking and do I do anything special with them before planting them the next spring? Can I plant sweet potatoes and potatoes from the ones I grow in my garden (although we usually don’t have any leftover to plant with)? My background is in horticulture (as well as art) so I sometimes forget to put things into layman’s terms. Sorry about that! I am hoping to do more posts on saving seeds from particular crops, so keep an eye out for that info as the gardening season gets under way. Onion seeds are black and sort of triangle shaped. They are ready when they shake from the seed head easily. Carrots and turnips are indeed biennials.The seeds will be ready to harvest when they shake from the seed head easily too. You want to make sure that the seeds are dried out before you store them in a cool, dry place for the following year. Yes, you can plant sweet potatoes and potatoes from the ones you grow in your garden. If there are any signs of disease, don’t replant them and be sure to plant them in a new spot. Don’t plant crops from the same family in the same spot for 3 years to prevent disease. I usually start with all new potatoes each spring, since we eat all of the ones I harvest most years. I recommend starting with potato sets that are certified disease free if you have had any signs of disease in the past. Thanks so much for the great questions Amber! I’ll try to get some good, solid gardening posts ready in the near future for folks looking for the how to info. Let me know if you have any other questions! I’m happy to help out when I can! Pingback: Can You Save Seeds from Hybrid Plants? I hope you can settle down and start a garden someday Sarah! Thanks for stopping by! I understand completely 🙂 And I still have some hybrids too. Mainly because I buy sees every year and seldom seem to use the whole packet. I have saved seeds for a long time, but just a few here and there, and didn’t take the self sufficiency idea too seriously in the seed dept. You can still collect seed and replant when you have hybrids, you just end up with a second generation that doesn’t have all the same characteristics as the first gen. I’ve often thought it would be fun to start breeding some new varieties, but haven’t taken that idea very far. Have a great season in the garden this year! Great post! Love your organized box of seeds. I am working on replacing all of our seeds to heirlooms as well. Best wishes with your garden full of heirlooms this year! Hope you’ll share some photos so we can oooo and ahhhh over them! great post with lots of details. I will be referring back as I plan the garden. thanks! Thanks for this, Lisa Lynn. Just the encouragement I needed to save something besides marigold seeds. Wow — you are so organized Lisa. 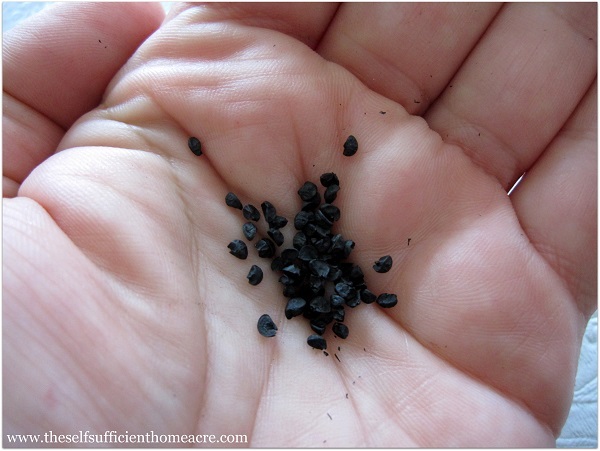 I usually save flower seeds every year — but they are scattered all over the house in envelopes and ball jars. Lol. Hey, that works too! That’s my former method of organizing my seeds, Nancy! I’ve had a couple successes with seed saving. I am able to save my currant tomato seeds year to year. they always do well in my garden. And I was able to save seed from my french pumpkins (the flat ones) and grow them the following year–but didn’t get as many pumpkins the second year. That’s great! I have found that the varieties of tomatoes that did well at our last house haven’t done as well in my new garden. So sad. 🙁 But I am trying some new varieties this year and keeping my fingers crossed. I love those French pumpkins! I’ve grown some in the past but the seeds were cross pollinated and I ended up with Franken-pumpkins! 😉 I wonder why you didn’t get as many pumpkins the following year? Hmmm, maybe the growing conditions were not as good. Best wishes with your future seed saving! We live in a climate where gardening is very tricky (Oklahoma). For that reason I have used hybrid varieties in the past, especially if I am growing something new that I haven’t done before. However, we are wanting to be more self reliant and I have been known to spend lots of $$ just on seeds. I’m a seed junkie. So we are making the switch to heirlooms and last year I harvested a few of our own. We have a few books on seed saving that I am getting ready to read so that we can be a bit more educated. Seed Savers Exchange is a favorite of ours too. Seed junkie 🙂 That just makes me chuckle. 😉 I guess I am too because I can’t pass by a rack of seeds without checking them out. Glad you are switching to organic! Thanks for the info about spacing between varieties. I plan on trying to save some peppers and beans for the next years garden, but didn’t know about the spacing so this will help me lots. We are so space and time constrained that seed saving is not something I can do a lot but like to do it with certain flowers as well as veggies. Interesting post and informative! Glad to share some info that was helpful! You can also hand pollinate and then enclose the flowers in a bag. That would be hard to do with beans, but maybe peppers would work. Best wishes and hope to see some posts about your efforts this summer. 🙂 Thanks for stopping by. I always love to hear from you! I really wish I had the yard to plant a garden. Once we get all of the trees cut down, I am hoping for an area with enough sun to grow our own veggies. I understand your predicament! I’ve lived in many a shady apartment in my day! I hope you have a wonderful garden started soon! I started saving seeds several years ago and have quite a large seeds stock built up. It is fun and can really save you a lot of money, but it also can become addicting! I have seeds in envelopes, jars and small containers all over my office! I only plant organic seeds and have just recently started planting heirloom varieties. Great post! There are much worse things you could be addicted to! 😉 I’m the same way with having seeds all over the place. But I did make some headway this year in getting most of it organized. I think it’s great that you are only planting organic seeds. I hope you’ll share some posts with us this year about your heirloom seeds! Awesome! I hope you are linking up to the hops this week! That’s a great topic to share 🙂 You could do an entire post on teaching the kids to save seeds! I just ordered a bunch of heirloom seeds and am so excited to plant them this year! We did heirloom tomatoes and zucchini last year and they were great, although I wasn’t able to save seeds from those plants since we moved before they were done harvesting. I’m looking forward to going through the whole cycle of planting and seed saving this year. Thanks for including the information about the plants cross pollinating and becoming hybrids- I’d forgotten about that! Thanks for stopping by and leaving a comment! I’m always happy to hear from you! Thanks for telling us about your seed saving and buying decisions! I agree completely that I want no part of the GMO seed debacle. There is an article about it in Discover magazine this month that I want to read. I have saved a few kinds of seeds but want to save even more this comming year. With the droiught last summer nothing was very good. I have did beans seeds, melons, etc. but none of the finer seeds that require more work. I grow almost all heirloom seeds as I want goiod tasting stuff even if it isn’t perfect. I don’t care anyway if everyhting is perfect. If it is it’s probably GMO or hybrid and I want no part of that. Thanks for the good post. Really enjoyed it. Bottom line what I’d like to find is my grandmother’s GARDEN MUMS seeds. She had some variety of Mums that were tall…not the small ones that you see in nurseries and stores now. The mums sound delightful! Are they an annual? I’m not sure that I’ve seen any available but you could check at Seed Saver’s Exhange…they have heirloom flower seeds. 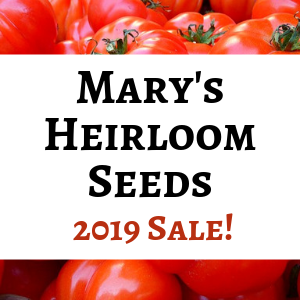 There is a big difference in prices, and if you can wait until closer to planting time you can often get them on sale. Mums are in the aster family, so maybe the tall mums you are thinking of are a different aster species. I have some native asters that are purple and grow 3-4 feet tall, unlike the commercial mums. Does that sound like what you remember from your grandmothers garden? Hi Lisa Lynn! I am *just* starting to save my seed in the past year or so. I’ve got Parris Island Cos (romaine lettuce) and a variety of radish I’m not sure of, though I think I’ve got it written down in my gardening journal. I’ve also collected coriander. I’m afraid that while I’ve done alright collecting and dating the seed, I haven’t done great at documenting the names. :-/ It’s great fun though! I know how that goes 😉 I generally gather my lettuce seed into a mixed batch. Since I plant a mix, it’s a lot easier and I have have very good luck with the new seed growing really well. My cilantro plants itself! So do a few other things. I can understand the frustration 🙂 Sometimes I have terrible luck with certain crops. The rot on the bottom of tomatoes (Blossom End Rot) is caused by uneven watering conditions. They like to have moist soil that doesn’t dry out too much between watering. It causes the calcium in the soil to become unavailable to the plant. You can add some calcium, but even watering practices is the best way to avoid the problem. I hope you try growing some of your own veggies again! I plant ONLY heirloom seeds and I save as many from my harvest as possible. Thanks for sharing! You rock Mary! I was wondering if the seeds you sell are from crops you grow? Hi Lisa! Only a few are from my own garden but I hope to change that this year. I have doubled my plans for the garden this year. All of the varieties I offer are from reputable companies that have NO ties to monsanto (the devil).